I'm still unpacking some bits after the move. I've not found the wooden runners that I made to allow the chassis to be put on the bench. My attention now turns to the cabinet back again. David, am I right in saying that the strenghthening bar pokes out below the bottom edge of the cardboard back? The metal bar is exactly 16 inches high and 1 inch wide. Thickness is 2.4mm. It does extend out by about 6mm at the bottom of the back cover. Last edited by FERNSEH; 8th Jul 2017 at 6:34 pm. I'm back on the HMV 905 after quite a break, during which I have moved house and been busy with fatherhood. When we moved I did not fit the CRT into the cabinet of the HMV because the neck bowl was mssing from the cardboad back. I have now made and fitted a neck bowl and am looking into sorting out the remaining niggles before the set finally goes back together. The first photo shows a CRT neck bowl that has been removed from a scrap back panel of a Cossor console set. A pencil line shows where the bowl had to be cut to make it smaller. The second photo shows my attempt to make the vent holes. This did not go too well and I decided to put less holes in the underside as the punch was getting blunt very quickly. It will have to do. The third photo shows the missing strengthening bar being made from 2mm Zintec. The fourth photo shows the inside veiw of the back panel with the neck bowl and strengthening bar in place. Note the un-riveted hole on the strengthening bar, this is also found on the original parts because it is impossible to get to that rivet with the neck bowl in place, quite a funny design error really. The fifth photo shows the completed back. I didn't replace the rusty original rivets on the neck bowl because removing them would have involved damaging the material around them. You've not done a bad job with that back cover, I'd be happy with that. I spent some time making a punch to produce those slots and it was a total failure due to the back cover material being so thick. I've spent many hours making back covers and can do a decent job but it would never look as good as an original. I'm now fortunate enough to have a good set of scan coils now. However the pictures look very soft. I decided to do an IF sweep from the aerial input. By using an arbitary waveform generator I can accurately set the centre frequency and sweep length. This is all the more important with a digital scope as there is no X axis input, so we are reliant upon the sweep rate of the scope and the signal generator being pretty well matched in terms of linearity. Ignoring the first and last centimieters of the graticule, the scope shows a range of 41MHz to 49MHz left to right, at 1MHz per centimeter, with 45MHz in the centre of the display. The upper waveform is the 1Hz FM sawtooth to which the scope is triggered and the lower waveform is an inverted view of the output to the CRT. You can clearly see the unwanted sound on vision response at 41.5MHz and the limited bandwidth of the vision IF. I will need to disconnect the CRT in order to turn the chassis on its end and tweak the vision IF response. I was however able to improve the sound rejection from what you see here by tweaking the sound IF adjusters (which you can do from the top of the chassis), but not before I had added yet another extra capacitor across a sound IF coil to get it to peak properly. I've never done IF adjustments in this way before and it seems that great instant results become quite easy to achive, indeed I purchased the waveform generator specifically to sort out the IF response of the 905. The third photo shows the pictures as they currently are. I have a choice of poor right hand focus or if I reverse the focus coil wires, good overall focus, but ion trap shading. I'm thinking that degausing the focus coil might improve matters. Also you can see how a well focussed picture still seems soft due to the poor IF response. Not only is the HF end limited, but the screen shot also shows a very poor LF response, which is odd as the CRT drive is DC coupled. I've ordered a spare MS4B video detector and amplifier valve to help me track down the problem, but it maybe related that the peak vision response is not centered exactly on 45MHz as it should be. With my 901 I had aligned it by following the EMI instructions but it still needed quite a bit of iterative tweaking to get the 3MHz bars resolved without overshoot or poor LF response. My Aurora doesn't manage to generate better than the 2.5MHz bars. First, congratulations Andy on what you're achieving! Not only is the HF end limited, but the screen shot also shows a very poor LF response, which is odd as the CRT drive is DC coupled. If this is like the 904, the video drive is coupled via a parallel C and R, shunted by another R at the cathode (there's also a series L further back). If the tube were soft and this meant it was presenting an appreciable load instead of a high impedance to the video feed, would this not change the effect of this drive arrangement, and cause reduced LF? One interesting thing about my HMV 904 was that the setup instructions provided by the manufacturer were not ideal. Although they clearly favored gain over bandwidth. After setting up my set and then sweeping the antenna input, I found that their intended video bandwidth was only about 1.4MHz. Of course on a smaller CRT, depending on the focused spot size, this can be not as severe as first thought. Obviously they were wanting fringe area reception too. However, there is plenty of gain to spare, so what I did was set it up according to the attached bandpass characteristic. This is an exact transcription of what was obtained on the scope face. I used a vintage valve sweep generator applied to the input with a dummy antenna pad and used the Philips PM5326 for the accurate markers. (It is easy to couple the marker signal in simply by clipping the lead onto the insulation of the signal wire from the sweep generator to create a fraction of a pF gimmick capacitor without altering the bandpass response and reducing the level to just see the marker as a small blip on the bandpass response). As noted on the attached record, I documented the projections of the screws above the round brass nuts they run in. (I have mentioned this before, post #134 and noted that the brass nut & screw threads needs to be immaculately clean and later seal with conductive paint, not wax, because the capacitance of the brass slug can alter the tuning independently of the inductance lowering effect of the brass). With the bandwidth pushed out to about 2.4MHz the picture is much better (attached). The set is still fine receiving a signal on about a minimum of 700uV to 900uV input (peak white carrier level) but it needs about 1mV to just get out of the snow. Generally I run the RF output from my "Alexandra Palace transmitter" at about 2.5 to 3mV peak white carrier level. My set was fitted with NOS valves so I think this is about as good as it gets. The 5FP4 I was forced to use (not able to get the 3/1), was designed by RCA for a small sharp focussed spot which helps a little too. With this CRT you can clearly see the scanning lines on less than a full height scan. Of course the 904/5 etc the detected video appears directly out of the video amplifier (anode bend detector) so the sweep voltage seen there (using a x10 probe) as noted, is quite high in the range of 20v. The contrast control has some effects on the bandpass characteristic so it is best to have it set as noted. Another thing about this set, because of the high overall gain, if the tuned stages are incorrectly peaked too close to the same frequency, it becomes unstable and oscillations occur. I spent some hours getting the stage tuning as perfect as it could be, it is much more of a challenge in the 904 than the usual TV IF alignment which is a walk in the park. I would recommend setting it up initially at least with either the MFR's instructions, or use the screw projections I documented, then with the sweep and marker generators make small adjustments to get the bandpass characteristic as I have documented and it will get you a long way toward a satisfactory end point. Also note that when the video adjustments are made the sound ones need re-adjusting. When it is correct, notice on the sweep the relatively low response in the video output at the sound frequency. Last edited by Argus25; 9th Nov 2018 at 10:53 am. That's an interesting point. I see the line structure in your screen shot but I think that's just the half scan. With the small CRT it's probably not visible with the full frame. I see the line structure in your screen shot but I think that's just the half scan. With the small CRT it's probably not visible with the full frame. I guess that could have been a possible scenario, however the photo was taken in a darkened room with a long exposure compared to the field rate, so probably that is less likely but still possible. It is very difficult to get a good photo that actually resembles the view of the face. The scanning lines with direct view are clearly visible on a 5FP4 with a 405 line raster, it has a very small diameter sharp focused spot. The photo looks softer than the image looks in reality. I've cropped your screen shot (right hand side) and compared it with what I think is a full scan. If you are using a long exposure then perhaps the set is not interlacing correctly. I guess you'll need to magnify the image below to see the detail. Principally in the background. Last edited by peter_scott; 9th Nov 2018 at 3:21 pm. The other thing I found about the 5FP4 was that full frame scan (to cover the complete circular shape) was not possible at standard drive levels. Is there a replacement-type 7-inch tube that could go into a 905? Yes, you are quite right. I magnified the image. The height of those small boxes represent about 7% of the active vertical scan time. So it is either a photo of just one field, or the interlace was poor. Yes, that is right, the vertical drive needs increasing a little for a 5FP4, which is also why it needs the added resistor in series with the sawtooth integration capacitor, to give a trapezoidal wave at the output valve's g1, to assist rapid flyback, otherwise , with the increased drive, the linearity suffers a little at the top. I'm not sure about a possible tube for the 905, possibly a 7QP4, which off hand is magnetically focused and deflected, but I'd have to check if its non-aluminized. The 7DP4 used in the 621TS could work, but the circuit would have to be modified for electrostatic focus. There is a Russian TV CRT that would work, but I cannot recall the number off hand. I'm already testing with a Russian 18ЛК5Б CRT. It seems the best fit really, especially as it has an ion trap. Another posibility was the 7BP4, but this CRT is hard to find. I actually managed to import two of the Russian CRT's. The second one I obtained was actually NOS and I passed it on to Mikey405 for his EKCO. I've been trying to get another CRT over since then, but the only lead I did have fell through. Due to the trade restrictions with Russia, I have had to get the tubes from the Ukraine, but they are harder to find over there. Perhaps someone fancies a road trip to Russia to pick up a few CRTs? Anyway, I digress. Back to the HMV 905. I do hope the CRT is not gassey and there is no easy way of checking it out. Maybe I have to bodge the CRT into my TV22. Regarding the interlace, a good spot, but not something I'm concerned about just yet. It might be due to the setting of the synch control which on the face of it (without checking for interlace) seems to do nothing. When I first rebuilt the set I did indeed align it using the method in the manual, but as the IF coils are so heavily damped it was hard to know where the sweet spot for each coil really was. Hence I purchased the signal generator with a mind to do a better job of it. Frequency markers are not really necessary due to the fact that the signal generator is digitally synthesising the frequencies and so its output will be perfectly linear. There is however a slight roll off in amplitude in the VHF range due to the signal generator's output stage, but if I actually inject it into the IF amplifier with a centre frequency of 8MHz then its output will be very much the same across the IF bandwidth. I've been under the weather the last few days with silly cold, but hope to get back to the set soon. Looking at your screen shot it does show the same lack of interlace that Hugo's does. This might be a peculiarity of the 905 but it might also relate to the Aurora. I found a similar effect with my Sony 9-90. I wonder if this interlace issue could be another side effect of the Aurora (like the 'hooking' on a TV22), when it's set to provide equalising pulses? Or maybe just try this setting, whichever it is, the other way round? Equalising pulses were of course absent on the original signal. This might be a peculiarity of the 905 but it might also relate to the Aurora. I found a similar effect with my Sony 9-90. I took those photos some months ago and checking them they had different shutter speeds although both still grabbing full frames so I thought I'd better check with identical settings. I still found the same result so I then tried adjusting the Sony 9-90 frame hold and found that I could get good Aurora interlacing. Here's the result. The first image is Aurora and the second is Graphics. Both are without equalising pulses. If you hold a magnifying glass up to the screen you can adjust the frame hold for best results. Last edited by peter_scott; 10th Nov 2018 at 11:20 pm. With equalisation pulses on the Aurora the range of frame hold adjustment on the Sony 9-90 for interlaced scan is definitely increased. I have looked at the interlace issue in the past. In every pre-WWII I have the interlace is poor, even with a video signal with equalizing pulses. Investigation of this showed that the primary cause was excessive integration of the vertical sync pulse. The small 1/2 line timing difference gets swamped by an excessively long RC time constant. ( was not due to the vertical osc triggering from another source). In fact in one of my American pre-war sets; the time constant was 10 times too long. In the post WWII period, the Americans completely solved the issue. They realized that the filtering properties of a single stage R-C filter was not suited to a vertical sync pulse separator (that is if you wanted perfect interlace) it had to be a two stage filter, so as to get good filtering off of the H sync, but a fast rise time due to the shorter time constant. So they settled on a two section filter, Typically series 10k, 0.005uF to ground, then another series 10k and another 0.005uF to ground. Some set makers went further to a three stage filter. The typical recommended time constant for this application is around 50uS. 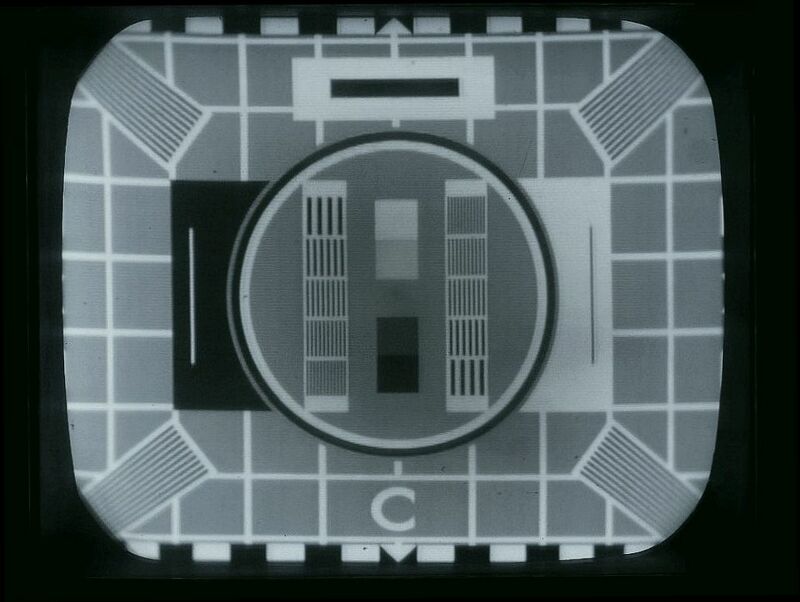 It seems in the post WWII period, British set makers were slower to catch on to this notion, but by the late 1950's, most sets had better vertical integrator circuits in the vertical sync separators, and interlace issues practically vanished, except for issues of triggering from a non sync related source. I only have one pre-WWII set and that is the HMV901 and it has excellent interlacing regardless of whether I supply it with the Aurora or Graphics signal and regardless of the very wide range of its vertical hold adjustment. With the Sony 9-90 the vertical hold can be adjusted for poor interlacing on the Graphics signal but there appears to be a much greater range with poor interlacing on the Aurora signal without equalising pulses.